Prickly and Bitter: Wine? Wine not! 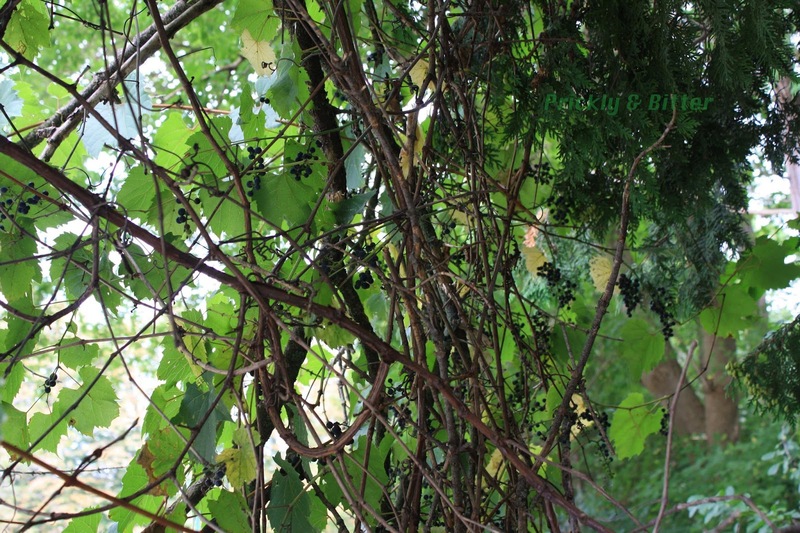 The riverbank grape is one of our great native vine species (the other major native eastern North American species to be featured in the next blog, Virginia creeper). It is a very vigorous grower, capable of growing up to the top of a riparian forest tree canopy (not nearly as tall as a "normal" tree canopy of a forest, since trees that live in riparian, or riverbank, areas don't tend to be able to grow as tall). In the southern areas of its native range it can be a real pest species, but here in Ontario other native species are pretty good at competing with it. Some trees have a harder time than others, but non-native species have an especially difficult time with the smothering tendencies this species sometimes has. That being said, as soon as it is transplanted, either naturally via bird poop (the most common animal vector) or "artificially" via human transplantation, into an area of lowland or upland forest the forest canopy can really suffer as a result. It is remarkably good at smothering new saplings before they have a chance to grow tall enough to escape it, and some forests are so thick with grape vines they're impassable. A great example of a species that grows well in harmony with other species in its native habitat, but can become a real pest, even in its native range, if introduced beyond those limits. The riverbank grape has a bit of a bad rap in Ontario and the northeastern United States, but that perception seems to be changing a bit. 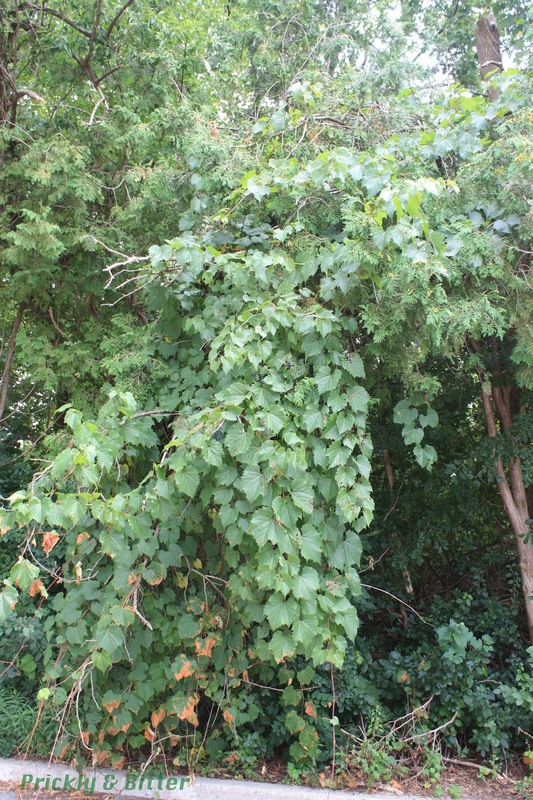 In the 1940s and 1950s, the US government (the Canadian government quickly followed suit) decided that riverbank grape vines were a forest pest and that this species should be eradicated. There had been a lot of accidental introductions of this species into areas important in the logging and lumber trade, and if you're allowing a vine to smother your profits you're not a very good businessperson! So instead of just local eradication programs, these programs were carried out across the United States and into Ontario and Quebec, and whenever a riverbank grape vine was seen in a forest (either riparian area or otherwise) it was sprayed with very toxic herbicides. This was very effective at killing the vines, but also equally effective in killing all of the surrounding vegetation and poisoning the soil (both for soil microbes, very important in forest health, but also making it inhospitable to new seedlings). Unfortunately, it was far too late before anyone realized what was happening, so you still find "dead zones" where mature trees escaped the soil poisoning by having a root system vast enough to support itself with un-poisoned soil, but the understory species are completely missing. I have a rather personal connection to riverbank grape, because one of the species of fungi that I study for my PhD grows exclusively on grape vine in North America. 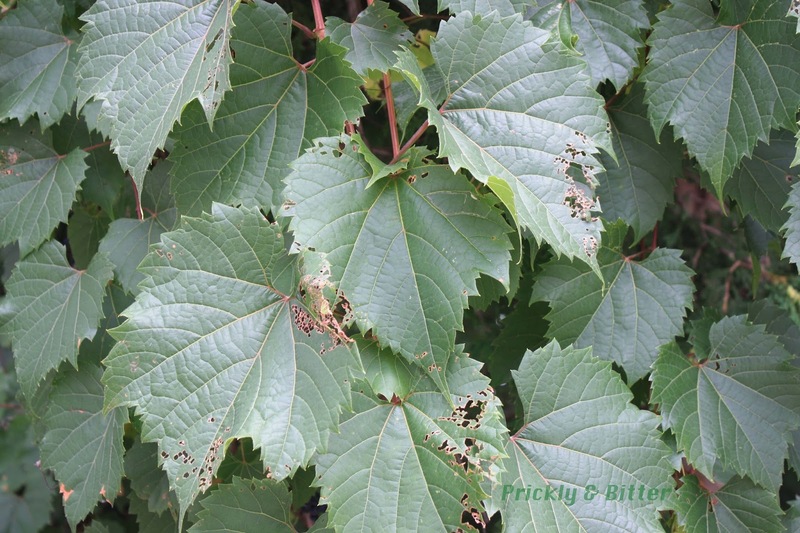 Unfortunately, there's a catch (as there always seems to be with rules regarding where fungi are most likely to be found): it only grows on mature, living or dead grape vine. This means that any suitable habitat that might have been in forest ecosystems in the 1800s when a lot of the work was being done on the fungal flora of North America no longer exists for this species. For this reason, it was collected three times in the 1880s by great, now long-dead, mycologists only to never be recorded ever again. Have these species gone extinct because of our destruction of their host species? No one, including myself, knows that for sure. Since the 1930s there has been a lack of concerted effort to document the diversity of forest species, only re-invigorated in the early 2000s. What I can say is that for the last 6 years whenever I'm in a forest where there's grape vine I look for it...and haven't found it yet. Perhaps I'm not looking in the right spot, or perhaps it doesn't exist anymore. I'll let you know in 20 years when I either find it or give up looking. ;) This idea of "disappearing species" is not unique in mycology; there are also a lot of plant species that were discovered during the times of the Great World Explorers (as I like to call them) that have never been found again. Part of the problem stems from the lack of location data for the collections--how do I know where "Aunt Edna's House, near the south greenhouse but past the wood pile, 5 minutes from the beach" is?! Sure, maybe EVERYONE in 1872 knew where Aunt Edna's house was...but it's long gone by now. You don't realize just how useful GPS coordinates are until you have to figure out something like that! Riverbank grape fruits are reportedly edible, and were also reportedly an important food source in the summer for early settlers in North America. Now, I'm guessing that tastes have progressed a bit since those times, or perhaps they were much less picky eaters than we are now (or maybe a bit of both). 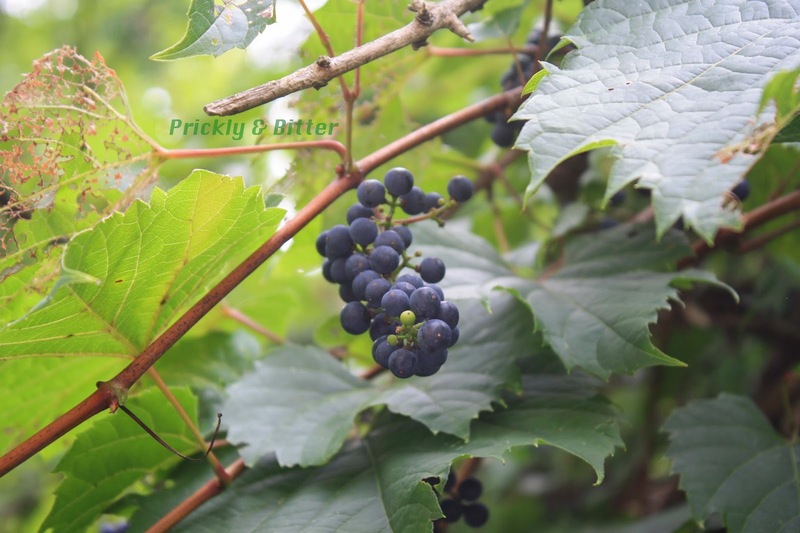 Have you ever tried a grape from a wild grape vine? They are TERRIBLE. I wasn't expecting a sweet grape when I tried one, but holy jeez. This was...terrible. That's the only way I can describe it. It was gooey and had the most awful texture on the planet (almost like jello on the inside), plus one of the most sour fruits I've ever had in my life (puts the Cornelian cherry to shame, which you can read all about HERE, and I often eat lemons for fun...so that tells you something about my tolerance for "sour"). My friend Tanya convinced me to try one when we were out geocaching one afternoon, and I could taste the lingering "lip-puckering sour" in my mouth for hours. That's the last time I ever listen to Tanya. Ha. Sure, the grapes don't taste that great and the plant isn't all that much to look at (although, I personally really love the shape of their leaves and the cute little curving tendrils that are most visible during the winter and early spring), riverbank grape is one of the single most important "novelty agriculture species" that we have in North America. I call them an agricultural novelty not because their use is new, but because the product we get from them is certainly not necessary for everyday life (some people might argue with me on that one; we'll agree to disagree) nor has it ever been. Wild grape vines are VERY tolerant to winter conditions in North America, which can be incredibly harsh, especially in the ground. Traditional wine grape vines, of the species Vitis vinifera, don't have a very cold hardy root system, and are prone to freezing damage in northern climates. 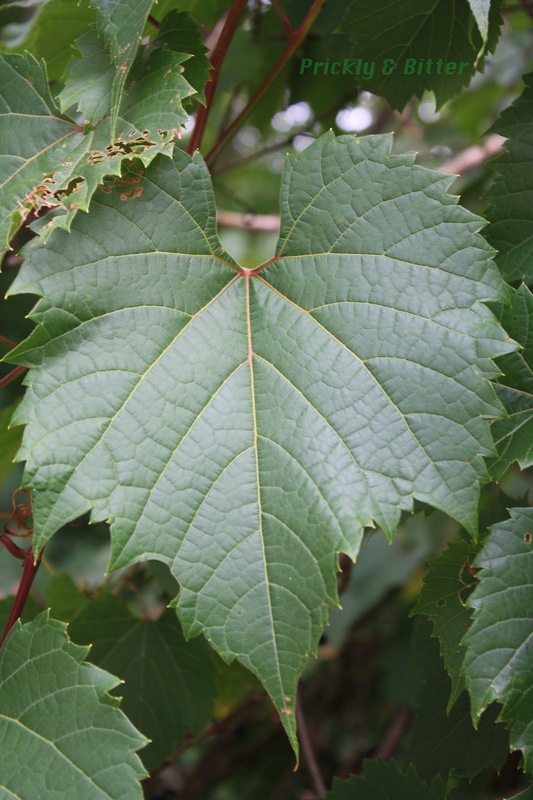 For this reason, riverbank grape rootstock is often grafted onto a wine grape scion (or "top") for commercial grape production for the wine industry. Once grapevine producers were experts in the creation of natural hybrids, they started experimenting with different varieties of V. vinifera as well as V. riparia to make more cold-tolerant grape vines, but with the same commercial qualities of traditional wine grapes. Another major benefit is that the resulting hybrid is much more resistant to common fungal diseases encountered on grape vines. Eventually what was obtained were varieties that were genetically 50-80% wine grapes, and 20-50% riverbank grape. Baco Noir, Marchel Foch (sometimes called Marechal Foch) and Frontenac grapes are all hybrids between these two species, and produce some of the best wine in the world. 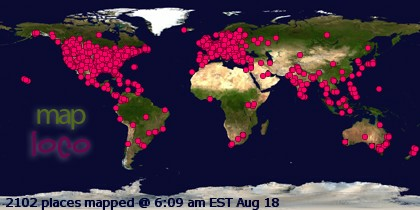 Isn't it amazing what a little traditional plant breeding can do?! Cheers to grapes. Traditional uses by Aboriginal North Americans are also numerous; they are used as a food (although, I'm guessing in small numbers), to make jellies and jams, and to produce a type of traditional North American wine. From what I understand, this wine is really unpleasant when compared to wine from a "real" winery, but it really packs a punch: it has 2-3 times the alcohol content of a traditional wine. Maybe it's alcoholic enough you don't realize how terrible it is! Not commercially sold, but every so often you might be able to find some courtesy of a backyard brewer. Let me know how it is, if you get a chance to try it.